With so many independent releases by artists who don't have names that are immediately recognizable competing for your ears, and hopefully a place in your collection, it's hard to separate the real stuff from the fly by night homemade projects by bar bands. Virtuoso guitarist Lawson Rollins should be a big name, but he is working outside of the realm of commercial pop music. His stunning guitar duo, Young and Rollins, came along after the shine had worn off the popular Nouveau Flamenco genre and airplay for innovative music had disappeared. So here is this strikingly original exploration of the possibilities of fusing flamenco, salsa, and bossa-nova influences with elements of Persian, Arabic, and Indian music, and morphing the music into something entirely new. He has also mixed multinational instrumentation - the sounds of sitar, tabla, tombak, kamanche, mordad, sarrod - with contemporary jazz influenced sax, trumpet, horn sections and keyboards and a string orchestra from Prague. To put it in a familiar context - if you still sneak out your old Ottmar Liebert CDs, and are a fan of the Latin influenced elements of Acoustic Alchemy and Steve Oliver's work, or Craig Chaquico's electric/acoustic adventures - Infinita will lure you into much broader expansions of those themes. Infinita is the perfect word to describe the scope of this project, with its seemingly infinite amount of influences, textures, moods and sonic and rhythmic shifts. What makes it exceptional and accessible is that this is all done around the framework of recognizable melody lines. The musicians bend them, twist them, stretch them and reconfigure them, but always return to them; which allows a lot of playing around without making the project sound like it is just a showcase for virtuosity or a patchwork of disparate elements. "New World Raga," is a perfect example. There is so much happening in this song that it's hard to describe. Eastern percussion blends with intricate guitar work, vocal chanting, a touch of electronica, and guitar and kamanche soloing within a traditional Indian classical framework. It is held together throughout by a single melody and improvisations around it. “Streets of San Miguel" follows, this time surrounding Latin-flamenco guitar work with haunting, dreamlike textures and an evocative trumpet solo. "Through The Night" has Rollins playing flamenco runs at breakneck speed over Middle Eastern textures, and then it shifts into a salsa-driven keyboard and horn section. He plays both acoustic and electric on "Southwind," creating an interplay rarely heard in this type of music. The amount of different sounds he can pull out of a guitar is beyond impressive. He can do a fast flamenco run, flip from a scorching lead line that has his hands flying on the fretboard and the strings, to soft lyrical chording, and create a buzz saw effect or speed-race the high notes, all with effortless precision. Rollins assembled a group of musicians who have created some of the most innovative world/jazz fusion music over the last 30 years. Percussionist Airto Moreira and Flora Purim have been on the scene since the seventies, and Purim's work here comes closer to the purity and clarity of her Return To Forever vocals than anything she has done in years. Purim's daughter Diana Booker joins her on "Cafe Jobim," the joyous bossa-nova party that opens the CD, as well as the introspective title track that opens with just Purim's lovely voice and a Rhodes-sounding keyboard. Violinist Charlie Bisharat is a first-call violinist whose most high profile appearances were with Yanni at the height of his popularity. Producer and multi-instrumentalist Shahin Shahida's duo, Shahin and Sepehr, was one of the first to add trance and electronica elements to their music in the early 90s, percussionist Dave Bryant and keyboardist-producer Dominic Camardella both worked with Ottmar Liebert and bassist Randy Tico was part of Strunz & Farah's band. They are joined by a group of musicians who are virtuosos on some of the more exotic instruments that add a flavor to the album that separates it from so many of the guitar driven world music albums. Infinita is hypnotic, intriguing and energizing. It plays on your imagination and opens your senses to whole new worlds of sound. 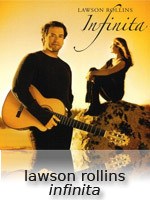 Hear more of Infinita on Lawson Rollins' MySpace page. Be amazed by his technical virtuosity on video as he plays his own composition, “The Fire Cadenza” on YouTube.